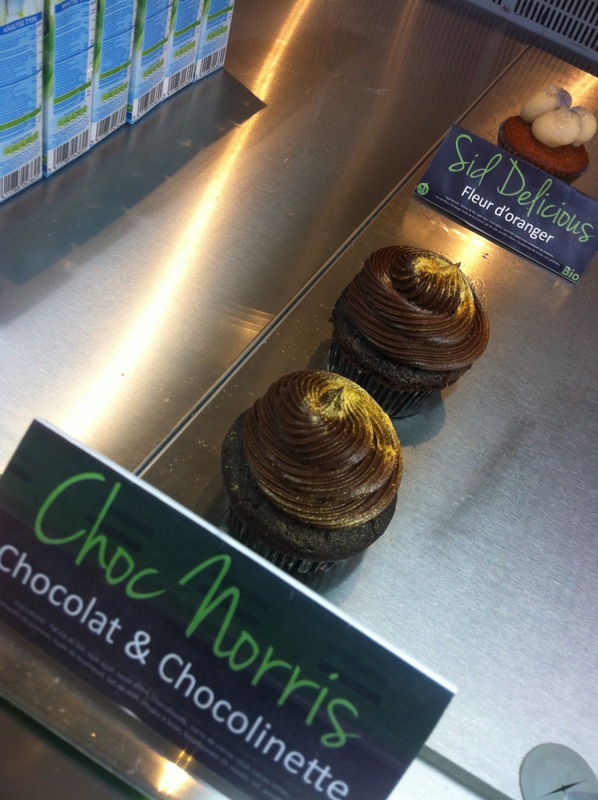 I can't think of a cheerier way to commemorate an otherwise rough rentrée than with adorably named (Choc Norris? Sid Delicious?) and organically baked vegan cupcakes! Vegan Folie's , which has been serving Paris' Mouffetard neighborhood since December, uses local flour and organic ingredients to create a variety of baked goods, including cheesecake, brownies, cookies, and of course cupcakes. All ingredients are 100% vegan- even the cleaning products used in the kitchen are non-animal tested and vegan certified- which makes this place a must for vegans and animal activists of all sorts. But Vegan Folie's isn't only for the veggie-minded- the bakery serves a wide range of clients from the lactose intolerant to the veggie curious, from neighborhood kids to dessert seeking tourists. Their creative cupcake varieties, include blends of apricot & lavender, ginger & lemon, vanilla & almonds and, obviously, chocolate & more chocolate (an organic version of Nutella, actually). Every day the bakery is host to a "Cupcake du Jour"- follow their blog for updates on the daily special. The bakery also puts a new spin on cupcakes (as if being the only vegan cupcake shop in Paris didn't already distinguish them) introducing savory cakes such as "L'Italien" a basil cake with sun-dried tomato frosting and "Le Libanais" which is a falafel cake with hummus frosting. Cupcakes are priced at 4€/each, with the 6th cupcake free if you're ready to buy bulk. The bakery can also do personalized cupcakes or larger orders if you contact them in advance- all the information is on their website.